After deciding to embark on a mission to find the best single serve coffee makers on the market, as you can imagine, we tried a lot of machines and made a lot of coffee! Out of all of the machines we tested, we loved the Hamilton Beach 49981A – and its bargain price under $40 made it the obvious choice for our best budget single serve coffee machine. Often with budget products, you will find they are badly made, or don’t function as well as they should – this isn’t the case at all with the Hamilton Beach Scoop. It’s a fantastic little machine that works well, looks good and won’t make a dent in your pocket! Who is the Hamilton Beach Scoop for? Who isn’t the Hamilton Beach Scoop for? The beauty of this model is that you don’t need anything else. No extra equipment is required to use the machine (except a coffee grinder of course). The truth is, the Hamilton Beach Scoop works well! It’s really easy to use, as there’s no need for programming anything. Simply add your coffee and choose whether you want a standard cup or a bold cup. The bold cup setting is ideal for people who want a stronger, richer flavour to their drink. As a rule of thumb, if you use a fine grind, choose bold, as the brew is much slower allowing the water to really extract the full flavour from the bean. If you use a denser grind, the standard drip speed will work just fine. The only things to look out for are to make sure you don’t fill the scoop above the max fill line, and you don’t add more than 14oz of water to the water tank. As long as you stay within those guidelines, both of which are clearly marked, you won’t have any leakages. The machine only allows for freshly ground coffee and isn’t compatible with pods. This could actually be seen as an advantage by genuine coffee lovers as the pods will never match freshly ground coffee for density and flavour, but it does mean that you have to be willing to put the time in to grind your own coffee. The machine is a bit slower than other options the market. An 8oz cup takes around ninety seconds, and a 14oz cup takes around two and a half minutes. Who is the Hamilton Beach 49981A for? The 49981A Scoop machine aims to combine simplicity of use with value for money and great tasting coffee. By that standard, the machine is a perfect choice for anyone! The machine is ideally suited to anyone who doesn’t want to use pod coffee but still wants the ease that comes from a single serve machine rather than an often complicated barista style machine. Who isn’t the Hamilton Beach 49981A for? The Hamilton Beach 49981A isn’t best suited to large families where you all want to sit down and enjoy a coffee together. The combination of the auto shut off feature and the time taken to brew the coffee means it’s best suited to making one cup at a time. After reading this, we’re sure you can see now why we chose the Hamilton Beach Scoop as out best budget single serve coffee maker. It really does do everything a more expensive model will do, and the simplicity is an advantage. For the price you will pay, fill your travel mug daily. 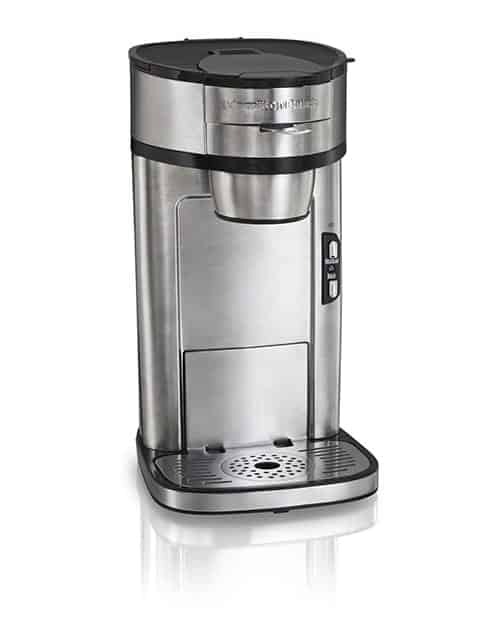 Within a couple of weeks, the Hamilton Beach 49981A will have more than paid for itself on what you will save by not having to buy expensive coffee house coffee every day.